Mystery surrounds search engine optimization (SEO). What is the best way to accomplish SEO? Pay for Google ads? Find a shady, off-shore company to click on your site 100,000 times? Use a consultant? Plunge into the SEO world on your own? This article will assist content generators to better understand and assist clients with SEO. As communicators of information, medical writers need to be aware of what works and what does not in writing for the purpose of search engine optimization (SEO). Having good solid information for readers in the best SEO. Google considers pages that have “an impact on your current or future well being [sic]” Your Money or Your Life (YMYL) pages. YMYL pages contain content deemed by Google to have a big impact on your life—obviously medical information falls into this category. YMYL pages are scrutinized more than non-YMYL pages. To understand SEO, it is necessary to understand how a Google search works. Google keeps its computer program, or algorithm for searching the web, a deep, dark secret. That’s fine; I am not qualified to dissect lines of code—let’s go with broader concepts. Google web crawls, or looks through the content of web pages. Web crawling is done automatically, any time of the day or night. The website needs to be available at all times (no down servers), to keep the web crawlers (called spiders) happy. As with many things, there are “white hat” and “black hat” methods. White methods are good, upfront means to build SEO. Black hat methods are seen as devious and underhanded. The preferable way to optimize your ranking in a search engine is to develop good, useful content. This is white hat SEO, versus trying to fool the search engines, the black hat approach. Having all kinds of slick tricks may work for a while, until Google realizes what you are up to, which will then lead to your ranking sinking like a rock. Google can and will penalize your site in the rankings if you violate their best practices guidelines. Or they could even remove you from their indexing service. Black hat methods are eventually figured out by Google. Once Google finds out what you are up to, not only will the ruses fail to work, you will be punished. Try to stick to the white hat method of SEO—develop good content that is useful to readers. 1. Select appropriate key words. This can be trickier than it sounds. Brainstorming with the client is a good place to begin. If you are working on a project, be sure to visit Google Ad Words. I believe you can still set up an account without having to purchase anything. 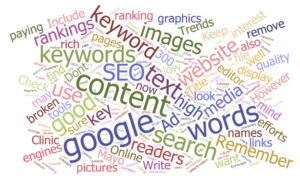 Use the tools to search various words that your target audience may use to find your client. 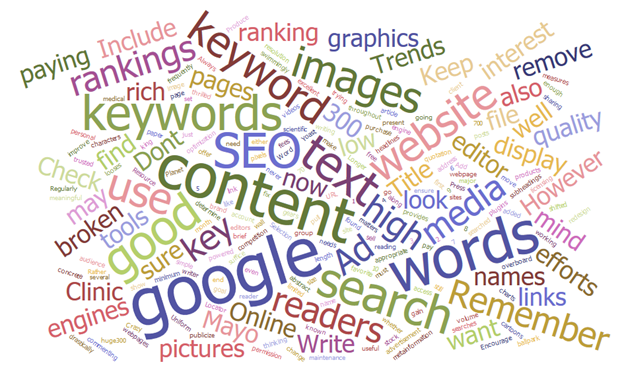 Google will give you data on how often these words are searched on Google’s search engine. 2. Find a good online text editor with SEO optimization tools. Online webpage text editors such as Word Press offer free SEO plug-ins like SEO powered by Yoast. Or if you are writing a scientific paper, ensure that keywords are in the title, abstract, and throughout the article; a simple keyword search in your favorite text editor will suffice. 3. Make your file names keyword rich. Include keywords in all file names, whether for text, images, or other media. Title display in search engines is limited to first 70 characters, so keep your headlines brief and keyword rich. Your URL (Uniform Resource Locator or website address) also needs to have keywords. Don’t go overboard with keywords—limit yourself to 5 to 7—or Google will move you down in the rankings. Word Cloud based on this article. 6. Write with the end goal in mind: Are you publicizing your group, promoting your personal brand, or working for a client to sell products? Information is key. Be sure to inform your readers about good information they need. Normally, medical writer generate informational web content for a general audience, like those visiting websites. Use simpler sentence construction and terminology. 7. Add images and other media. Good pictures, graphics, charts, cartoons, and even videos added to your pages will improve search engines rankings. While you want the images to display with enough resolution to avoid pixelation, do not make them huge—300 by 300 pixels is a good ballpark for image size. Smaller or larger sizes may work, too. Remember to use keywords in the meta-information for your pictures and other media. Get permission to use images or pay licensing fees for stock images. 8. Content is king. Write content well, with useful information for your audience. Produce high quality content and remove any low-quality content. Encourage sharing and commenting on your content. 9. Maintain your website. Regularly check for broken links and either fix or remove them. Google is serious: they threatened to de-list a non-profit website for not fixing a hacking that took advantage of their excellent SEO. Keep in mind a major redesign of a website may drastically change your search ranking. 10. 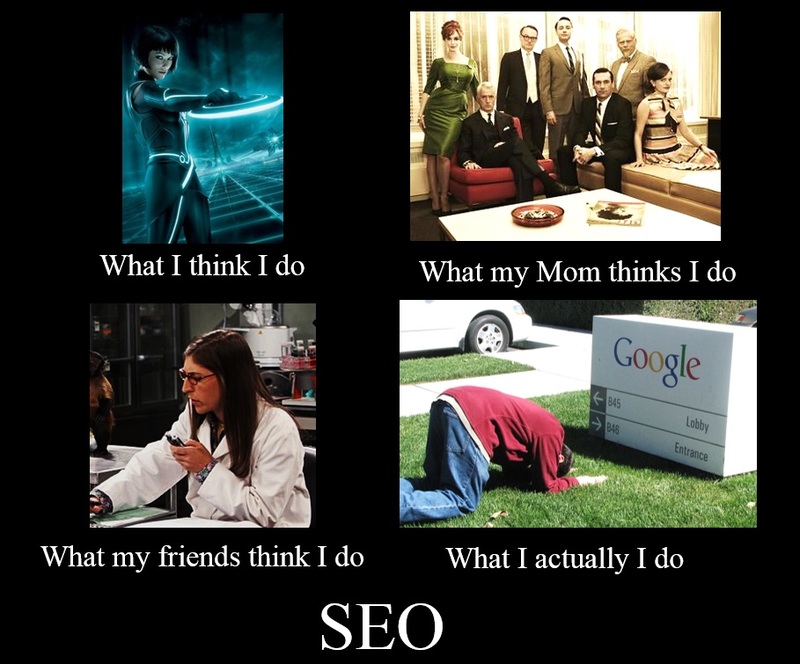 Are your SEO efforts paying off? Check your rankings once a month to show concrete measures of how well your SEO efforts are paying off. DeeAnn Visk, PhD, is a freelance medical writer and editor. Pharmacogenetics, high throughput screening, cell culture, molecular biology, and in vitro diagnostics are her areas of expertise. DeeAnn lives in the San Diego area with her husband, kids, and two spoiled hens. You are welcome to contact her at deeannlwv@gmail.com. This entry was posted in medical writing, Search Engine Optimization and tagged medical writing, Search Engine Optimization, SEO on April 26, 2016 by admin. Thanks for this extremely informative article. As someone who is just getting their freelance writing business off the ground, I appreciate you breaking down SEOs into a chewable form. Thanks for your kind comments. Yes SEO can seem really formidable when you first get into it, but it quickly becomes second nature.